Her Majesty the Queen visited Canada recently, and during the visit, we got to thinking about what her dogs do while she is away? CanadaVet.com decided to find out! The current Queen is, of course, associated with the Corgi. According to the official Royal website, the breed was introduced to the Royal Family by her father, King George VI, in 1933 when he bought a Corgi called Dookie from a local kennels. The animal proved popular with his daughters and was described as ‘unquestionably the character of the Princesses’ delightful canine family’ and ‘a born sentimentalist’. A second Corgi was acquired called Jane who had puppies, two of which, Crackers and Carol, were kept. For her eighteenth birthday, The Queen was given a Corgi named Susan from whom numerous successive dogs were bred. Some Corgis were mated with dachsunds (most notably Pipkin, who belonged to Princess Margaret) to create ‘Dorgis’. At present, The Queen owns four Corgis: Linnet, Monty, Willow and Holly and three Dorgis: Cider, Candy and Vulcan. And the official answer to our question about the Queen's pets while she is away? 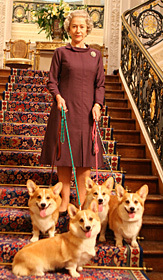 The Palace advises that the Queen’s corgis travel with her to the various residences within the UK, with Her Majesty looking after them herself as much as possible given her busy schedule, but unfortunately they are unable to travel with her on her trips outside Britain and are cared by appropriately trained Palace staff.